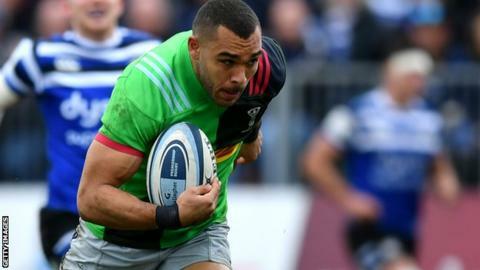 Harlequins won their fifth Premiership match in a row as Nathan Earle's last-ditch try helped them beat Bath in a thrilling game at The Rec. Earle went over in added time as Quins came from behind to strengthen their hold on third place. Joe Marchant's brace, as well as Chris Robshaw and Alex Dombrandt's first-half tries, also grabbed them a bonus point. Tries from Jonathan Joseph, Nathan Catt and Ross Batty looked to have won it for Bath, who led 29-21 at one stage. In a seesaw contest, the lead changed hands three times after Quins raced into a 14-0 lead as Robshaw and Marchant crossed in the first 10 minutes. Bath clawed their way back into contention when England centre Joseph notched his first Premiership try of the season and Rhys Priestland landed two penalties. Dombrant then restored Quins' advantage when Marchant turned provider for their third try but Catt's finish from a pick-and-drive on the stroke of half-time meant Bath were just five points adrift at the break. Priestland added two more penalties before Batty's converted try moved the Blue, Black and Whites into a seemingly unassailable eight-point lead with 16 minutes to play. But, after concerted Quins pressure in Bath's 22 late on, Marchant went over again for his 13th Premiership try this season to bring them within three points. After replacement scrum-half Dave Lewis had a try disallowed on the fringes of a Bath ruck, Earle then had the final say for the visitors with his brilliant finish in the right corner. "For the effort the lads put in, to not come away with the win there is really tough. "Quins are a quality team and if you give them a 14-point lead, it's always going to be difficult to come back from. "I thought the boys battled back well in the second half. We sped the ball up at the breakdown, started to play through them a bit more but then let them back in the game at the end, which is frustrating. "The margins are so small in this competition, so we need to make sure our preparation and execution are bang on to put us clear at the end of 80 minutes." "A great moment in the season for us - a real pivotal finish. We could've walked away from here with two points, instead we take five. "We would've been disappointed if we hadn't won that game. We started really well, Bath probably didn't and we capitalised on that. "Then we probably didn't play too well for 40 minutes and Bath did, getting themselves back in the game. "The last 20 minutes was a real humdinger of a game I thought. We have to show that fight and togetherness that we did for the remainder of the season." Bath: Burns; McConnochie, Joseph, Roberts, Vuna; Priestland, Chudley (capt); Catt, Dunn, Thomas, Attwood, Stooke, Grant, Louw, Mercer. Replacements: Batty, Obano, Perenise, Douglas, Reid, Fotuali'i, Willison, Homer. Harlequins: Brown; Earle, Marchant, Tapuai, R Chisholm; Lang, Mulchrone; Boyce, Elia, Collier, Symons, Horwill (oo-capt), Glynn, Robshaw (co-capt), Dombrandt. Replacements: Ward, Marler, Ibuanokpe, Merrick, Clifford, Lewis, Smith, Saili.